"Whether ‘imaging badly’ in speech, or ‘speaking evil’ in images, blasphemy has long been with us. But as far as I know, the Greek word blasphemy (βλασφημέω) does not appear in Homer or Hesiod. Liddell and Scott have it first in Euripides’ Ion and then in Plato’s Laws (‘when some worshipper… breaks down into downright blasphemy’). Blasphemy seems to have come in with philosophy and law, especially when the Law, ‘that which is laid down’, became explicit enough to distinguish between ‘evil speaking’ (blasphemy) and its opposite, ‘virtuous speaking’ (euphemism), in a legal sense. Blame is a doublet of blasphemy, and the law is concerned with assigning and apportioning blame; or fame, which is also based on what is said about someone or something." In Book II of the Republic, Socrates discusses with Adimantus and Glaucon the origins of justice and injustice in states, and at a certain point it becomes clear that blasphemy is key to these origins. Socrates is presenting his brief against the ‘false stories’ of the poets Homer and Hesiod, contending that these stories corrupt the youth. The blame comes, he says, ‘When anyone images badly in his speech the true nature of gods and heroes, like a painter whose portraits bear no resemblance to his models’ (377, e, my emphasis). This lack of verisimilitude is not only aesthetically displeasing; it is injurious to the state. This is in the middle of Plato’s most full-throated censure of the poets and their blasphemies, in which he claims, ‘while they speak evil of the gods they at the same time make cowards of the children’ (381, e). Homer and Hesiod are singled out because ‘there is no lying poet in God’ (382, d). As it turned out, of course, there is no lying philosopher in God, either, and Socrates was eventually tried for blasphemy (against the Athenian ideal of the polis, really), found guilty, and suffered the ultimate punishment. But since blasphemy breaches the unspeakable, it is clearly in the realm of the poets. Poets are makers (poein); they make things up. When I was a young poet in San Francisco, Eric Havelock’s Preface to Plato was an important book among the poets who were my teachers in the Poetics Program at New College. Robert Duncan had gotten the book from Charles Olson, who called it ‘the only work in criticism which is relevant at all to developments in thought and poetry over the past 150 years’. Havelock’s thesis is that Plato’s condemnation of the poets in the Republic is based on the fact that the oral tradition of Homer and Hesiod had become a technological obstacle to the new ways of thinking being brought about through literacy. I teach Preface to Plato now, partly because Havelock’s well-formed argument about the transition from the technologies of orality to literacy is useful today as an analogy for our current transition from literacy to the image. Whether ‘imaging badly’ in speech, or ‘speaking evil’ in images, blasphemy has long been with us. But as far as I know, the Greek word blasphemy (βλασφημέω) does not appear in Homer or Hesiod. Liddell and Scott have it first in Euripides’ Ion and then in Plato’s Laws (‘when some worshipper… breaks down into downright blasphemy’). Blasphemy seems to have come in with philosophy and law, especially when the Law, ‘that which is laid down’, became explicit enough to distinguish between ‘evil speaking’ (blasphemy) and its opposite, ‘virtuous speaking’ (euphemism), in a legal sense. Blame is a doublet of blasphemy, and the law is concerned with assigning and apportioning blame; or fame, which is also based on what is said about someone or something. The Law, expressing the divine will of God, was laid down in the Pentateuch. It is often asserted that the Mosaic law against blasphemy is revealed in Leviticus 24:16, but the truth is that the law is already a given there, and this passage is a legal clarification of its reach. Shelomith’s son comes into the camp and curses the name of the Lord. The problem is that Shelomith is an ‘Israelitish’ woman (in the King James Version), meaning she is only half-Israelite. So the question is, does the law against blasphemy apply to this mixed-blood offspring? The people bring him to Moses because they’re not sure whether the law applies equally to a half- or quarter-Israelite. Jehovah speaks to Moses and says that everyone who heard the blasphemer should lay their hands on his head and stone him to death. The stranger is, in effect, judged to be worthy of punishment. In the Gospels, Jesus loosens the penalties against blasphemy somewhat, but there are still fine points of law to attend to. In Matthew 12:22–31 and Mark 3:22–30, an exception to the New Testament leniency in response to blasphemy is identified: blasphemy against the Holy Ghost. This particular offense is distinctly unforgiveable, leading to eternal damnation. Why? Because he who would blaspheme against the Holy Ghost has ‘an unclean spirit’. He is also, presumably, an adversary of Jesus, a Pharisee, who attributed Christ’s miracles not to the Holy Ghost, but to the workings of Beelzebub. That is what is unforgiveable. Blame and fame are not appropriately apportioned. 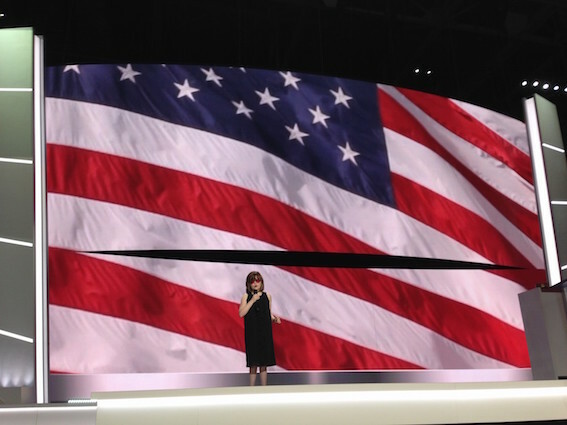 Blind singer Marlana VanHoose from Kentucky sings the national anthem at the Republican National Convention in Cleveland, Ohio, July 18, 2016. Photo by David Levi Strauss. Blame and fame, in the form of celebrity gossip and scandal, have become ubiquitous in our current image sphere, but the poet and film-maker Pier Paolo Pasolini’s life (1922–1975), death, and work marked a turning point in the modern blasphemy/blame/fame nexus. When his younger brother Guido, a Partisan in the Italian Resistance fighting the Nazis and Fascists, was killed by Yugoslav Communists in a power struggle in 1945, Pasolini was devastated, but still spoke out in favor of Communism as the only way to provide a new culture. Soon after joining the Italian Communist Party, however, he was charged with the corruption of minors and obscene acts and expelled. He fled with his mother to Rome. On 1 March 1963, Pier Paolo Pasolini’s film La ricotta – following a crew making a film about the Passion of Christ, with Orson Welles as the brilliant and loquacious Marxist director – was seized and Pasolini was charged with ‘insulting the religion of the state’. The statute invoked was a remnant of the Rocco Code, the Fascist penal code put in place by Arturo Rocco in 1931. Pasolini was found guilty and sentenced to four months in prison. This sentence was eventually overturned on appeal, but it took three years, during which Pasolini was continually under threat. The Catholic Church was initially ready to convict him of blasphemy for daring to make a film of The Gospel According to St. Matthew, but this turned out to be one of the most faithful depictions of the Gospels ever put on film. An homage to Pope John XXIII, it found enthusiastic approval when it was shown at the Second Vatican Council. Pasolini considered asking Jack Kerouac to play the role of Christ, but settled on a young Spaniard named Enrique Irazoqui. A twenty-two-year-old Giorgio Agamben also appeared in the film, as Philip the Apostle. Our current communications environment is preoccupied with arguments about blame and fame. A controversy has erupted over Jann Wenner’s decision to put a dreamy photograph of the Boston Marathon bombing suspect Dzhokhar Tsarnaev on the cover of the 1 August 2013 issue of Rolling Stone magazine: terrorist as rock star. The result of the controversy was that the issue sold twice as many copies as usual, and the all but extinguished reputation of Rolling Stone for social relevance was briefly revived. 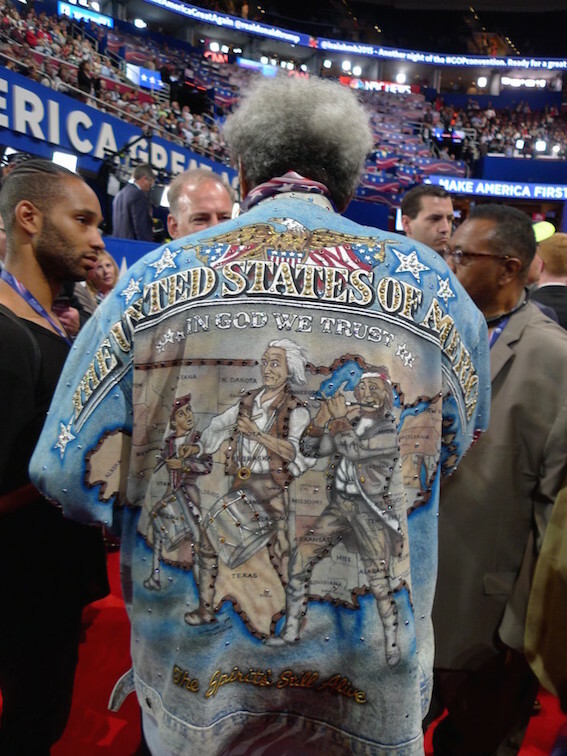 Boxing promoter Don King interviewed at the Republican National Convention in Cleveland, Ohio, July 18, 2016. Photo by David Levi Strauss. In his final film, Salò, or the 120 Days of Sodom, Pasolini took blasphemy and obscenity back to their source, in language – the language of Sade, yes, but also to the end of language, where power obliterates it. Salò is an unspeakable film. David Levi Strauss is the author of Words Not Spent Today Buy Smaller Images Tomorrow (Aperture, 2014), From Head to Hand: Art and the Manual (Oxford University Press, 2010), Between the Eyes: Essays on Photography and Politics, with an introduction by John Berger (Aperture 2003, and in a new edition, 2012), and Between Dog & Wolf: Essays on Art and Politics (Autonomedia 1999, and a new edition, 2010). He is Chair of the graduate program in Art Writing at the School of Visual Arts in New York.